The sunshine is not strong enough to light the heart. Give me true and lighted morning for once. Years after years, loneliness captures me. Every moment, you are my mystic icon. Survival in meagre veils, yet profound bliss. Completing the journey as we transcend. Tejas is a love story of vibrancy, incapacitated by rough weather of social alienation, yet bold and overwhelmingly conveying. An ecstatic state of fulfillment has glued the lovebirds Nalini and Tejas into an inseparable bond, who are hurdling over the challenges of falling apart. The story runs with inertia and penetrates into the periphery of conflicts and hypocrite stigmas. It escalates to lovely heights, constantly relishes the reader, with an invigorating feel of a cooling sensation, which one experiences after walking on blistering, hot, and parched land. The writer attempts to offer a simple love story based on a wise repertoire of experience. 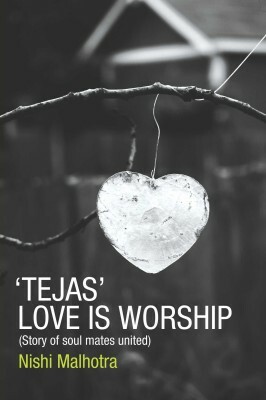 The author of a poetry booked titled Enigma, now brings you a romance fiction, Tejas Love is Worship. Nishi Malhotra was born in Delhi. She was educated at Delhi and graduated from Jesus & Mary College with a First class degree in Psychology Honours. She also has a diploma in Journalism, from IMI, Delhi and is currently pursuing a Counsellors degree as well. Human behaviour has always intrigued her and being an intense and emotional human being, she is sensitive to small intricacies of life. Even at the tender age of 8, she was known in school for writing the best of essays. Despite being a sensitive person; she is a survivor. Her writing shows her, as a person sensitive to love, care and reflects a profound search for understanding the self. The complexities of life, the magic in relationships, and the desire for an intrinsic and selfless commitment all emerge in the scaffold of the worship she believes in. The fundamentals of her philosophy are that life is a journey and people transport values, feelings and successful is the person, who has achieved happiness, under all controversial and explosive circumstances. She published her first book of poems in1998, and contributed several articles on the Girl Child to the Ministry of Health. She wrote an interview based programme for the All India Radio in1999, where she interviewed the then DG Police, Dr. Kiran Bedi and several other victims for her story on Domestic Violence. She went on to write articles on, Women and Drug Abuse. An autobiography that she started is yet to be completed, as being an extremely emotional and intense persona; she wants to lead it on till her life moves. This book has come after years of her initial publications and the reason again is sensitivity and a search into the enigma of life. CLICK HERE to buy 'Tejas': Love is Worship (Paperback) by Nishi Malhotra in Discount Price and Options with Cash On Delivery, 30 Day Replacement Guarantee.